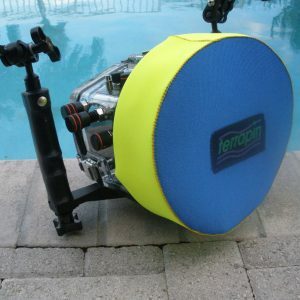 We recommend having a dedicated neoprene cover to protect the underwater lens or port of your housing, especially through the transition zone of transferring it into / out of the water and in the rinse tank. Even if your housing port came with a rubber boot, keep that for dry storage and get a neoprene one for wet use. 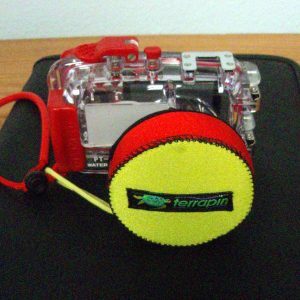 Terrapin Camera Lens and Port Covers are made with plush-lined 5 mm neoprene on the front and stretchy 3 mm neoprene on the sides. Large port covers have a back “lip” that curves behind the back side of the port. Small lens or port covers have straight sides. Both styles are finished with stretchy elastic edge binding to make it easy to get on and off, but still hold in place. There is a 3″ long elastic cord loop to allow you to secure the cover to the bracket or clip into a pocket when not on the housing.